The heritage of Rolex was celebrated at Baselworld this year with a series of new watches that fit perfectly into its classic codes, drawing inspiration from the past but very much looking to the future. The new Oyster Perpetual GMT-Master II takes its cues from a watch that debuted in 1955, and features a bidirectional rotating bezel that allows users simultaneously to tell the time for two different locations. The new Oyster Perpetual Datejust 36 and Datejust 31 models, meanwhile, delve even further back in time, to a collection that first saw light of day in 1945 – a series of self-winding waterproof chronometers that boldly display the date in a window at 3 o’clock. In the 1950s, international air travel began to boom and the original Oyster Perpetual GMT-Master was the perfect watch to celebrate that growth. Enabling travellers to tell the time for both their local and home time zones, it became so popular that it was adopted as the official watch of airline Pan Am, and one was used for navigational purposes in 1959 by the captain of the airline’s first non-stop flight from New York to Moscow. The three new versions of the Oyster Perpetual GMT-Master II feature a new calibre 3285 movement, an arrow-tipped hand that circles the dial every 24 hours, and a bidirectional rotating bezel with a 24-hour graduated Cerachrom insert in coloured ceramic. Adjusting the bezel means that it can be used to tell the time for a second time zone. 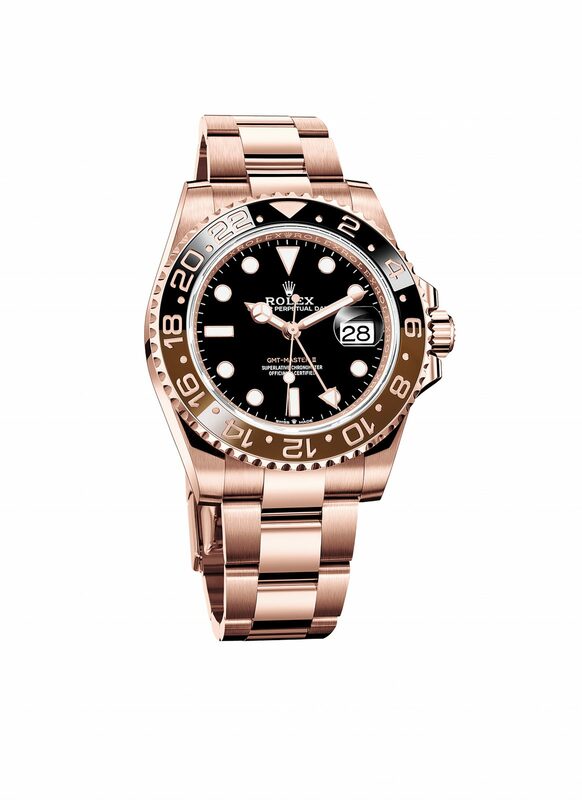 One of the versions comes in a steel case, with the Cerachrom insert in red and blue; the other two feature cases in entirely Everose gold or Everose Rolesor – the latter alternating Everose gold with steel – both with brown and black Cerachrom inserts. All feature black lacquer dials with luminous Chromalight hands and hour markers in white or pink gold. More than seven decades after it was first introduced, the Oyster Perpetual Datejust remains one of Rolex’s most instantly recognisable collections. Combining a number of innovations from previous Rolex watches, it was a trailblazer when it launched, as the first self-winding waterproof chronometer wristwatch to display the date in a window at 3 o’clock. The new timepieces unveiled at Baselworld come in a wide range of guises, but so iconic is the line that each of them is unmistakeably a Datejust. The new series of Oyster Perpetual Datejust 31 watches all feature a brand new in-house movement and redesigned sides lugs to their Oyster cases, which come in white, yellow or Everose gold and are guaranteed water-resistant to 10 bar. All of the pieces are powered by calibre 2236, a self-winding mechanical movement developed entirely in-house. It features a patented silicon Syloxi hairspring that’s insensitive to magnetic fields, dramatically improving the watch’s resistance to temperature variations and shocks. The new Datejust 31 is available in a wide array of dial designs. One highlight is a version in white gold with a white mother-of-pearl dial and a diamond-set bezel; another that immediately catches the eye features a diamond-pavé dial inlaid with pink mother-of-pearl butterflies, all set against a backdrop of Everose gold; while another iteration comes in yellow gold and shows off a malachite dial with the VI and IX markers picked out in yellow-gold Roman numerals studded with diamonds. All of the new pieces come accompanied by a President bracelet, and are fitted with a special concealed attachment system that smooths the transition between bracelet and case. A similarly reshaped case and another new movement also distinguish the new Oyster Perpetual Datejust 36, which comes in a range of models featuring a large selection of different dials, plus a choice of either Everose or yellow Rolesor. As with the Datejust 31, the lugs and sides of the 36mm Oyster case have been redesigned, and again the case is guaranteed water-resistant to 10 bar. Inside the Datejust 36 beats the new self-winding mechanical calibre 3235, which offers improvements in precision, power reserve – rising to about 70 hours – resistance to shocks and magnetic fields, convenience and reliability. One reason for that is Rolex’s new patented Chronergy nickel-phosphorus escapement, which ups both energy efficiency and dependability. Among the many different dial choices are one in Everose Rolesor with pink-gold Roman numerals and a fluted bezel; another in yellow Rolesor that boasts a champagne dial, diamond-set hour markers and a fluted bezel, and yet another in yellow Rolesor that glowingly combines a white mother-of-pearl dial with a diamond-set bezel. Each is available on either an Oyster or a Jubilee bracelet, again featuring the concealed attachment system.